Welcome to my T-amp blog and my first post. I bought a Trends TA-10.1 from Obad imports back in November 2007 and fell in love with T-amps. It's nearly four years later, and I'm surprised there isn't a dedicated forum (other than the excellent Italian language forum over at tforumhifi.com). I just sort of stumbled on T amps. I was looking for a small sized amp to pair with my iPod for an ultra compact system. I read the glowing review at sixmoons.com and I was hooked. The Trends amp really is wonderful, though I've since sold it and bought several other T-amps. This was my first foray into the audiophile realm and it really opened up my ears. The Trends amp uses the Tripath TA-2024 amplifier chip (like many other T-amps) and has a wonderful musical quality. The TA-2024 chip though isn't known for it's linear response. Audioheuristics has a very good write up of a similar TA2024 amp and it's frequency response is uneven. Yet, the result is musical. Much has been made of the similarity between T-amps and tube amplifiers, and maybe the non-linearity of amp is part of this. I have a personal theory that the wonderfully coherent sound of the tripath amps has to do with keeping all the frequencies consistent in the time domain. It's been written that some amplifiers "blur" sound by presenting different parts of the frequency range slightly earlier or later than others. 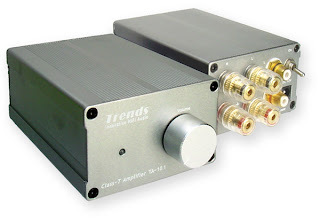 The Trends, like other TA2024 amps, has a meager 10 watts per channel. If your speakers are efficient though, you won't be disappointed. It's a little hard to find these days, I don't know of a source other than the Trends website which is based in Hong Kong. They have a new TA-10.2 SE model with an upgraded volume knob and power supply which I'd find tempting if it wasn't $225 plus shipping. My only criticisms are the plain jane "project box" appearance, rear mounted power switch and ridiculously bright blue power led. Hello, thanks for taking the time to review all these amps. Good work! Can't believe that not more people have commented.